For Non Healing Wounds, Ulcers, Gangrene. Reduces amputation risk of Diabetic Foot. held at the Tamil Nadu Agricultural University, Comimbatore. March 16 - 19, 2006. 1. Aromatherapy - Spiritual Principles / Therapeutic Uses. 2. Nutritional Farming as opposed to Organic Farming. Pramod Vora is a Holistic Educator and a Health Counselor / Advisor to the medical profession. He is an internationally renowned Health Counselor from California, USA. He has successfully counseled thousands of patients, including celebrities and hundreds of Medical Doctors guiding them towards Perfect Health. He is on the Faculty of the prestigious A4M - American Academy of Anti-Aging Medicine which is the world’s largest body on Anti-Aging Medicine with over 22,000 MDs worldwide as its members. His landmark research in correlating Pathology with Detoxification and Rejuvenation has been published in the Anti-Aging Therapeutic Manual Volume 12 Textbook Series by A4M. These are used as Desk Reference Manuals by MDs worldwide. He has, for the first time, proved Aging as a Pathologically detectable and reversible disease and Anti-Aging Medicine as a valid medical science which has the capability of reversing the aging process in the human body. He is also on the Faculty of International Masters Course in Anti-Aging (IMCAS), which is a Paris based Organization and has Chaired the session in Anti-Aging Medicine. IMCAS is a prestigious EU based organization with an equally impressive following of Doctors worldwide. 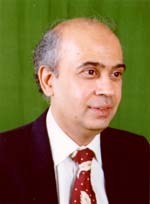 He has served on the Faculty of various Indian Medical Organizations. He has assisted BBC in the making of the Documentary Film "Stick Thin In India" released in March 2006 on Anorexia, Bulimia and Other Eating Disorders which identifies numerous medical causes of Obesity and how to correct them naturally. He was invited to present the following papers at the International Conference on Alternative Medicine held by the Ministry of Health at the TNAU, Coimbatore in March 2006 and has also Chaired one of the Sessions. a) Aromatherapy - Governing Spiritual Principles and its Therapeutic Use. 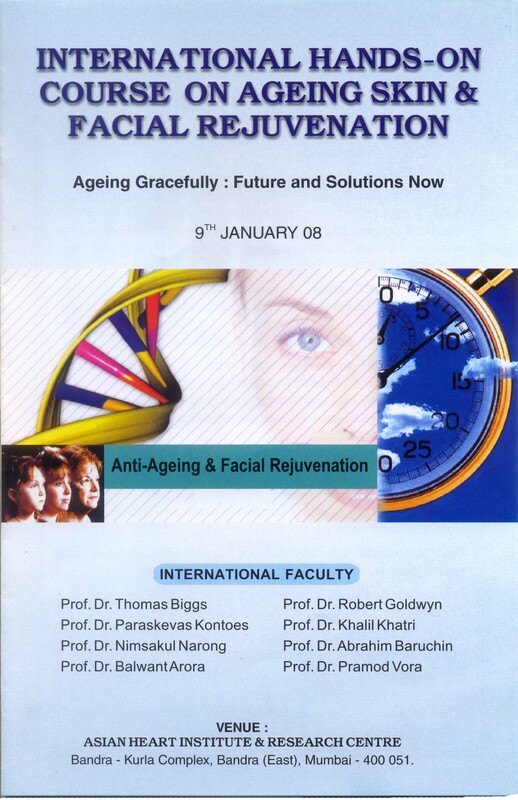 He was invited to be on the International Faculty for the "International Course of Anti-Aging Medicine" for Doctors held in Mumbai in January 2008, and presented a landmark study on "Detoxification and Intracellular Nutrition in Aesthetics and Anti-Aging". This course with CME Credits was attended by numerous internationals Doctors. He has developed a comprehensive program for Detoxification & Rejuvenation of the Body which is now an international accepted standard in Anti-Aging Medicine with Clinical Studies being published by A4M - American Academy of Anti-Aging Medicine. Over the past few years he has conducted numerous Seminars and Workshops for Doctors and Health Care Providers on various Medical Topics - Hormone Imbalance, Hypothyroidism, Hypertension, Bypass Surgery Alternative, Obesity, Diabetes, and various other chronic diseases for which there is no cure in mainstream medicine. He has conducted over two decades of research in the field of Nano Silver and its use as an Antibiotic, with Antibacterial, Antifungal and Antiviral properties. He has designed a hand held battery and mains operated Nano Silver Generator which disperses Nano Silver particles into a glass of drinking water. This has been successfully tested against numerous Gram Positive / Gram Negative Bacteria, Fungi, and Viruses like HIV-1 and Hepatitis B by an independent Lab accredited by the College of American Pathologists. This hand held generator can also be used to prepare larger quantity of nano silver solution for use in hospitals and clinics. It can also be used to prepare a Nano Silver Gel which can be used to sanitize the hands to prevent the spread of infections. His pioneering research in the “Activation of Stem Cells” with nano silver has reduced the world dependence on harvesting of embryonic and adult stem cells and has brought the cost of Stem Cell Regenerative Medicine to very reasonable and affordable levels for all. This has been successfully integrated into Fat Transplanting for Breast / Facial Reconstructive surgeries, Breast Augmentation, Body Sculpting and many other medical procedures. His landmark case study on “Regrowth of Fingertip After Amputation” showing regrowth of fingertip with full fingernail and fingerprint, using Stem Cell Activation Therapy, is unprecedented, having beaten the previous world record of 90 days for full regrowth set in 1995 by the late Dr. Robert O. Becker of State University of New York. to Lecture on various Medical and Health related topics. His interviews and opinions / quotes have frequently appeared, in the Times of India, Bombay Times, Mid-day, DNA newspapers to mention a few. Over the past few years he has conducted numerous Seminars and Workshops for Doctors and Health Care Providers on various Medical Topics - Hormone Imbalance, Hypothroidism, Hypertension, Bypass Surgery Alternaive, Obesity, Diabetes, etc. Please use this Questionnaire to give us the Case history of your Client / Patient and will be happy to give you Consultation on what is the best Natural Health Care Solution for this Health Challenge. Telephone Consultations for Root Cause Investigation and Diagnosis are also available internationally. Whole Body Detoxification and Rejuvenation. Root Cause Investigation, Diagnosis and Treatment offered for all Chronic Health Challenges. 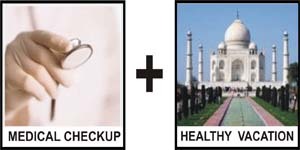 Herbal (Modern Ayurvedic) + Intracellular Nutritional Treatment for all Cardiac Problems, Diabetes, Thyroid / Hormonal Imbalance, Hypertension, UTI, Body Aches / Pains, Arthritis, Obesity, PCOD, Fibroids, Migraines & Kidney / Prostate Diseases. Programs to Boost Immunity offered for Hepatitis, Herpes, HIV / AIDs & STD / STI. DISCLAIMER: The infromation and experiences shared on any video tapes, on any audio tapes, in any handout materials are for educational and research purposes only and is not medical advice, medical diagnosis, or medical prescription. You are advised to seek healing solution from your personal, qualified health care Professional. Self treatment could be hazardous to your health. ©1995-2010 SpaceAge Concepts (India) Ltd. All Rights Reserved. .